The standard 1933 Goudey Baseball Card Set includes 239 cards that measure 2 3/8” by 2 7/8”. It was the company’s first baseball issue and considered the first great set of the bubble gum baseball card era. 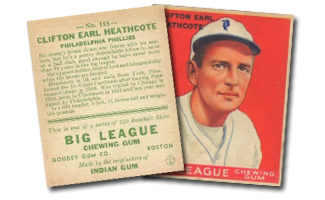 The 1933 Goudey baseball card set features color reproductions of the player’s portrait or action pose, the card backs offer a player biography. With four unique Babe Ruth cards, the 1933 Goudey is a favorite among collectors. Ruth appears on cards #92, #144, #149 and #181. There are two Lou Gehrig cards, numbers 92 & 160, are identical - except for the card numbers on the back. The 1933 Goudey Set, technically has 240 possible cards. Card #106 Napoleon Lajoie which was printed in 1934, and issued with a 1934 card front and, 1933 card back. The Lajoie card is so rare (and expensive) that it is not considered at part of the complete set. Over a quarter of the cards in the 1933 Goudey set contain Hall-of -Famers. Besides the 4 Babe Ruth and 2 Lou Gehrig cards, there are: #29 Jimmie Foxx, #89 Tris Speaker, #119 Rogers Hornsby, #154 Jimmie Foxx, #221 Hack Wilson and #223 Dizzy Dean to name a few. CLICK HERE if you want to sell your 1933 Goudey Baseball Cards (R319) . Showing 1 to 100 of 239 products.